Our Goal is to provide our customers with a high quality service that is prompt and within budget, making sure all customers are 100% satisfied. Our standards and process is designed to build lasting business relationships that exceed your expectations. Affordable Powerwash is a family owned business committed to providing all customers with reliable services at affordable prices. We use the latest equipment, technology and only environmentally safe cleaning products. In 1999, Affordable Powerwash was started as a part time business and with hard work and many loyal customers we managed to grow into a successful full time business that operates year round. 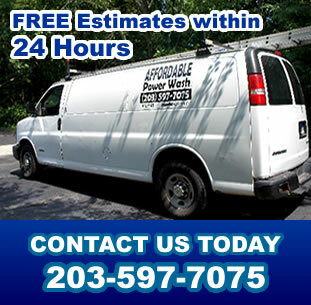 We have been satisfying Connecticut home owners and businesses with all their power washing needs from their child’s swing set in the back yard to massive condominium complexes. In addition to Powerwashing any surface we also do restoration of decks, painting, gutter cleaning and gutter maintenance. Customer satisfaction is guaranteed on every job. We believe our dedication to great service and integrity helps us grow lasting relationships with our customers.